I had been waiting for an opportunity to try the Coffee Jar for a fair while. It is not that it is in a remote location, it is in fact situated on Parkway just five minutes walk from Camden or Primrose Hill. Nonetheless it feels as if it needed a special trip to get there (and, though this is pre-empting the end of this cafe-physics review, it does deserve such a ‘special trip’). Inside, there is seating at the window and running along one wall, and although it is not the smallest of cafés, it is certainly a ‘cosy’ one. 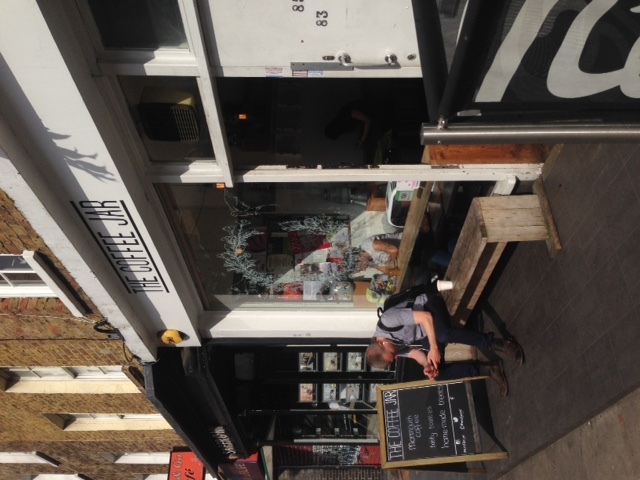 This is not intended as an estate agent’s euphemism but instead to emphasise the additional meanings of this word to convey a warmth and friendliness about the space that the Coffee Jar definitely has. So far, we have been twice (see, the ‘special trip’ is worth it!). The coffee comes from Monmouth and so unsurprisingly, on the two occasions I had a coffee there (Americano and Soya Latte), it was very well done and enjoyable. At the front of the counter are a wide selection of home made cakes and cookies. While this presentation can be awkward for allergy sufferers (nutty cakes or cakes with loose nuts on top are placed side by side with the nut free options which could give contamination issues), the cookies were very good (more on the cookies later). As befits the name, hand painted jars and coffee mugs decorate the end of the tables (and can be purchased should you wish). Individual art pieces decorate the walls while the window is painted with a scene that is somehow mirrored (shadowed?) in the ink prints on the take-away cups. All in all, there is plenty to notice in this “cosy” space. And so it took a fairly long time before I noticed the fish that was dangling above my head. Apologies for the blurry photo but you can see the robot fisherman on the shelf. Yes, this seemed an odd thing to me too, so I checked and indeed, a wooden fish was suspended on a string from something hidden on the shelf above my seat. At this point, an opportunity arose to go and sit at the window and so I was able to turn and look properly at the cause of the suspended wooden fish which was actually a toy robot. It just gets more surreal. But indeed, on the shelf above the seats against the wall was a toy robot fishing, a wooden fish hanging at the end of his (her?) line. A robot that is fishing can prompt a large number of questions which seem to me to be at the intersection of science and philosophy. To what extent has automation improved our lives? Is it a good or a bad thing to use robots in jobs traditionally done by humans? Moving away from robots and towards computers, what about artificial intelligence? Much has been written about artificial intelligence in recent years. There is some angst about whether robots will come to take-over the world with an ability to think that far surpasses our human ability. Alternatively, there are people who look to artificial intelligence with the hope that it will help us drive cars or investigate pollution or all manner of other (to a greater or lesser degree) useful things. One test that has been suggested as a way of establishing whether any particular computer, or artificial intelligence, can think is the Turing test proposed in 1950 by Alan Turing. A prize set up to reward the first computer “chatbot” that could reliably mislead human judges into thinking that it was itself a human (the Loebner prize) has so far not been won (a prize is awarded each year for the most convincing chatbot but so far, none has been so reliably convincing as a human to win the top, “gold” prize). 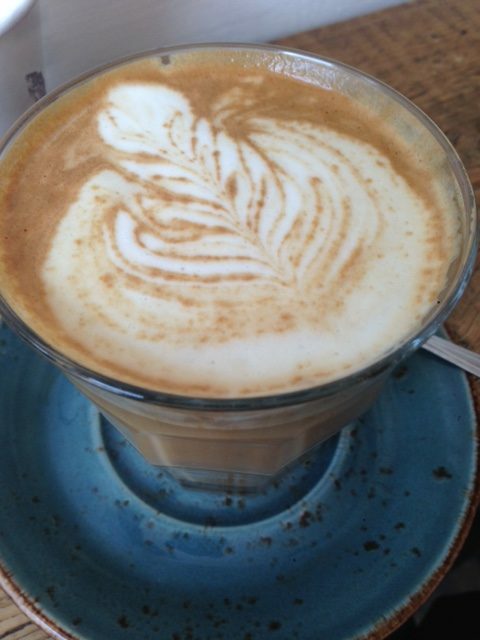 Unusually I had a soya latte. Which may make you wonder well, what would a theoretical physicist say about how we could define life? Erwin Schrödinger (1887-1961) had a very interesting, physics-based, definition of life. Although he is now perhaps more famous for his equation or his cat, in 1944 he wrote a book called “What is Life” (opens as pdf). To very briefly summarise, the argument goes that the tendency of all inanimate objects is towards equilibrium. A hot cup of coffee will lose heat to its immediate environment and so reach the same temperature as its surroundings, a small amount of blue food colouring at the bottom of a glass of water will eventually colour the entire glass a paler blue. To be alive is to defer this state of equilibrium for to achieve equilibrium is the same thing as death. Schrödinger argued that rather than merely consume energy, living things consumed negative entropy from their food-stuff. Entropy is a quantity introduced with the theory of thermodynamics. It is often taken as a measure of the order in a system (though there are caveats to that). The second law of thermodynamics states that for a closed system, the entropy of the system will either increase or stay the same. This suggests that to avoid equilibrium, or equivalently to avoid death, the living thing must consume order (or negative entropy) and somehow stave off this tendency to maximum entropy. To answer the objection that it would be easy to consume negative entropy by eating diamonds (which are highly ordered crystals) and so therefore that there has to be more to life than this, Schrödinger expanded on the thermodynamics of his argument. That bit gets quite technical and so is another reason that, if you are interested, it is worth getting hold of the book. So to return to one of the first questions but phrase it in a slightly different way. Could a robot cookie maker replace the “home-made” cookies that were on offer in the Coffee Jar? It turns out that this is a subject that my often-times cafe-physics review companion (let’s call them J) has quite an opinion about. 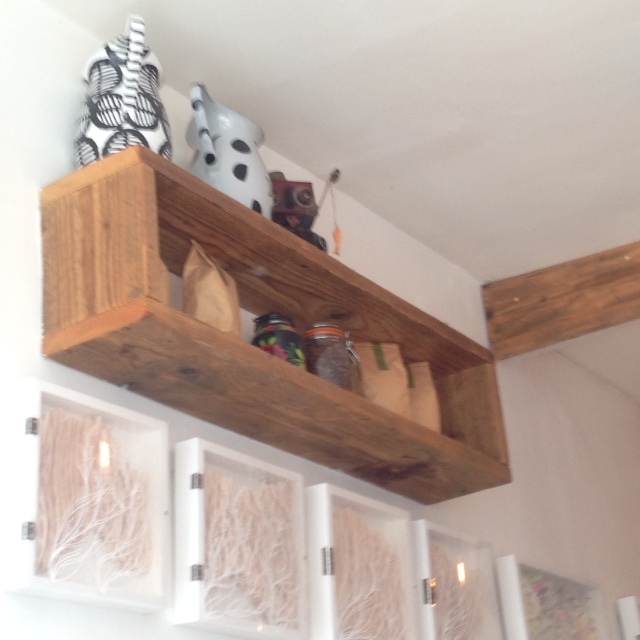 We visited the Coffee Jar twice partly because of the cookies! It seems to me that J would not have been impressed by the cookies were they robotically mass manufactured. There was something very appealing in the home made quality of them. So, there we go, one of the questions answered neither scientifically nor philosophically but on the very reasonable basis that home made cookies taste and look better. Do let me know if you agree if and when you visit the Coffee Jar.